Nik and Marnie Venema are living proof you don’t have to be middle-aged, established, and wealthy to be generous. These two millennials bracket either side of age 30 and still have student loan payments themselves, but they’ve already become significant donors to UFV, the place where they met, fell in love, and gained valuable educational and life experience. The Venemas’ generosity is creating two new student awards, through a combination of a personal donation of $12,500, as well as $500 from the RBC Foundation in recognition of Nik’s volunteer service, which was matched by the university. The two endowed leadership awards will provide $750 annually for a student involved in social justice work and $750 annually for a student studying Finance. Previously, the Venemas partnered with Justin P. Goodrich, a fellow UFV Alumni Association Chair Emeritus, to establish their first student award endowment at UFV, providing a $750 leadership award to a student who contributes through service on a governing body (Board of Governors or Senate) at the university. 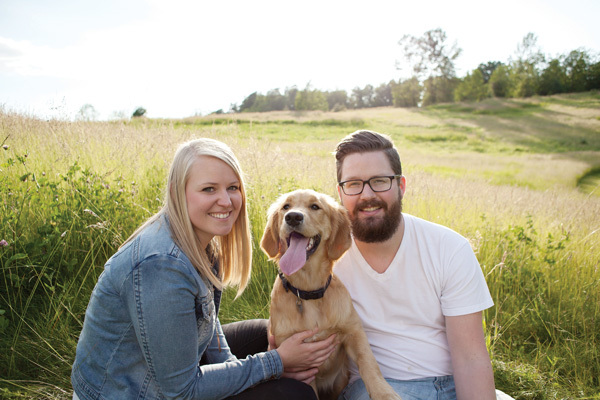 Nik (BBA ’12) majored in finance at UFV, while Marnie (BA ’15) majored in psychology. For Nik in particular, UFV was a life-changer. He had received a big entrance scholarship to UBC and was set to study engineering, but he lost focus and didn’t take advantage of that opportunity in his first year. When he contacted UFV about restarting his education, he received a warm welcome. 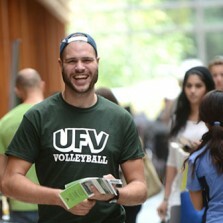 Once Nik was settled in as a student, he truly engaged with UFV. He volunteered with the Business Administration Student Association, worked as an economics research assistant, was involved in Student Life, and became an elected student member of Senate and the UFV Board of Governors. Upon graduation, he became involved with the Alumni Association, chairing it from 2015 to 2017. He was also a Supported Learning Group leader, through which he met Marnie. He was leading a calculus group, and she led a history one. Supported Learning Groups (SLG) are learning facilitation sessions for difficult courses led by senior students who have done well in the course. Not only did they each find their future partner through the SLG program and related social events, the experience solidified Marnie’s career interest in counselling. All along the way, the Venemas valued the education they were receiving. When Nik and Marnie got married they decided that philanthropy would be a priority at the core of their relationship. Nik’s background in finance led them to create a family foundation early on and they concentrated on accumulating capital within that foundation for several years, with a view to becoming donors early in life. Nik and Marnie still have student debt and have taken on a mortgage. But like a mortgage, they see their student loans as something to be paid off over the long term, balancing those payments with other priorities like philanthropy. “We’re going to be reaping the benefits of our education for the rest of our lives. We see the time we spent in university as an investment in our careers, so we’re not concerned if we have to amortize this investment over a few decades. We might not spend that much time paying it back, but as a principle, we look at matching that liability against the useful life of our education, so we’re not in a rush. “People should consider philanthropy when they’re young because it’s so rewarding. Many don’t think seriously about it until they’ve made their millions or are approaching life expectancy. It’s a pleasure to see these awards given out and meeting the recipients year after year,” says Nik. “I think some of the most influential aspects of my degree at UFV were the sociology classes I took. Many of the things I learned in those courses have been built upon in my master’s degree in counselling psychology. As a counsellor, I am interested in working alongside individuals in their healing process, but am also very aware that many of the problems my clients come in with are contributed to, exacerbated by, and even created by, larger systemic problems in our society.